Madam Speaker, I rise in support of the bill. As the Minister has stated, the issue of illegal tour guides is a growing problem, rising with the tourism boom in Singapore in recent years. Tour guides in Singapore need to undergo recognised courses and examinations in order to be licensed. The over 2,300 licensed tour guides here are made up mostly of Singaporeans and Singapore Permanent Residents. Illegal tour guides not only affect the livelihood of local guides but they may provide wrong information about Singapore and damage our efforts to promote Singapore as a tourist destination. Hence, I support the measures in this bill that will provide greater powers for the authorities to act against illegal guides such as fines for both the illegal guides and the tour agencies that knowingly engage their services and will provide greater clarity on what constitutes as illegal guiding. I have two areas which I wish to highlight for operational considerations. The first is about the Taxi Tourist Guide scheme, launched in 2004, ten years ago. The scheme is to train and license taxi drivers to allow them to act as tour guides for small groups of tourists. Section 19C of this Act defines a tour guide as someone who ‘provides any guiding services to 8 or more tourists.’ A taxi can never take 8 or more passengers. Hence there seem to be some discrepancies here. Does this mean that taxi drivers who wish to act as tour guides do not need any licensing and the Taxi Tourist Guide scheme is now redundant? And on this topic of Taxi Tourist Guides, I like to understand from the Minister if this scheme has been popular. If not, what are the reasons? The second is that this Act provides the power for the inspecting officer to detain and arrest any suspected illegal tour guide if the officer reasonably believes that he or she has committed an offence as defined by the Act. The arrested person can be brought to a police station for questioning. The tour guide may be in the midst of leading a busload of foreign visitors. The arrest would leave these visitors stranded in the middle of a tour destination. For practical considerations, inspecting officers must handle the situation carefully or it may leave a bad impression of Singapore with the visitors. Procedures on how to inform the tour agency involved and getting an immediate replacement tour guide from the agency or other arrangements to allow the suspect to settle the visitors first will be important. This is to minimise disruption to the innocent visitors who are just out here to enjoy Singapore. Mr Deputy Speaker, I rise in support of this Bill. The Prime Minister has announced last year the creation of two new local universities, the Singapore Institute of Technology (or SIT) and the Singapore Institute of Management University (or UniSIM). They will be Singapore’s 5th and 6th universities, certainly a big change from when I was a student and there was only the National University of Singapore (or NUS). Last year, then-Senior Minister of State for Education, Lawrence Wong had said Singapore’s economy has room for more graduates. Indeed the desire of our local population for higher studies has long been there. In 2011, in response to my parliamentary question, MOE revealed that there were about 41,000 Singaporean Citizens and Permanent Residents who were pursuing undergraduate degrees at the private universities and Private Education Institutions. For every local studying in a publicly funded local autonomous university, there was another local studying in a private university here. The number of locals pursuing private undergraduate studies is even larger when we consider those studying overseas, as MOE did not track this number. These recent moves will see more locals being supported in this aspiration with more government-funded university places for them. Last month, I had a chat with a young banker named Lawrence. Lawrence told me that he was playful when young and just managed to make it into the polytechnic. It was at some point during his polytechnic studies that he decided he needed to work harder. He graduated from the polytechnic but was unable to secure a place at NUS or at the Nanyang Technological University (or NTU). He said he was fortunate that the Singapore Management University (or SMU) allowed him to take the SAT examinations. He qualified through SAT, worked even harder and graduated with 2nd upper honours. He has now worked at two international banks and is a proud father of two. He was grateful for that break to do his studies in a local university as the cost for private university would have been very high. SMU was then the new third university offering more chances at university education to people like Lawrence. SIT was established in 2009 primarily to allow polytechnic graduates to top-up their diplomas to an external university degree in a field related to their polytechnic studies in targeted growth fields. With this Bill, SIT will now be a university able to offer undergraduate and postgraduate programmes of its own. What is the ‘Institute of Technology’ brand? People would associate a learning institution with such a name with industrial, engineering, sciences and technology capabilities. I did a google search on the term ‘Institute of Technology’. It threw up a long list of universities and polytechnics from all over the world. These range from lesser known educational institutions to those with long and rich histories and which are highly ranked in the world. The Swiss have long established themselves as a centre of technological and scientific excellence. Their two federal universities that are classified as Institutes of Technology are highly ranked globally. They have produced many Nobel laureates, including Albert Einstein. Germany too has a strong engineering and technology history. They also have highly sought after Institutes of Technology. The nine largest and most renowned technical universities in Germany have formed the TU9 German Institutes of Technology. There is also a family of Institutes of Technology in India whose alumnus run Fortune 500 companies. Their graduates are highly sought after by top technology firms around the world. The Massachusetts Institute of Technology is widely recognised as one of the best universities in the world. It began humbly in 1861 with three principles: (1) the educational value of useful knowledge, (2) the necessity of “learning by doing,” and (3) integrating a professional and liberal arts education at the undergraduate level. I like its strong emphasis on the practical aspects of learning. What will SIT, a newcomer in the business of university education evolve into? How will the brand of ‘Institute of Technology’ in Singapore be defined? I wish to share some practical concerns for SIT going forward. First is the lack of a single campus, unlike the other universities. A physical campus is important to generate a sense of identity and belonging amongst the students. SIT facilities are decentralised across the different polytechnics, dispersed throughout Singapore. Students will be at the polytechnic where their programmes are being offered. They feel a greater sense of identity with the polytechnic rather than with SIT. SIT also does not have hostel living which NUS and NTU have, which can provide important experiences for university students in their total development. While I understand the history of SIT and why it was decentralised at its formation, it may be useful to consider a central campus in the future when it becomes feasible. Meanwhile, SIT may have to work harder at building its identity amongst students through programmes that may cut across physical facilities. Second, SIT will face intense challenge for students from the more established local comprehensive research-based universities in the form of NUS and NTU, niche universities like SMU, SUTD and Yale-NUS College and from UniSIM, a teaching university with a longer history through its Open University background and its association with SIM. This is especially so when SIT opens its programmes to A level school-leavers. This is the challenge for the SIT pioneers; its management, faculty staff and students to rise up to in order to establish the branding and recognition for SIT. Starting afresh will allow SIT to explore its own niches. As an applied and practice-oriented university, the role of the industry will be important to SIT. I believe strong links with the industry will be necessary, such as attachment programmes and experiential learning. SIT’s current batch of students are likely to be more matured in age than NUS, NTU and SMU and many may have work experiences. SIT can continue to play a useful role for working people wanting to acquire a degree. To cater to such students, SIT can explore mode of operations that fit such students better. This can include shorter quarterly academic terms of 3 months. Where practical, it can also explore the sandwich degree arrangement where students will need to undertake a placement year or longer internship in the industry, typically in the 2nd or 3rd year of studies. SIT could play a role in strengthening Singapore’s technical capabilities. I have previously shared in this House of my concerns of our SMEs not able to grow under the shadows of MNCs and GLCs. This may also be an opportunity to help grow our medium enterprises in key industries we wish to develop. SIT could be required to focus on working with emerging medium enterprises so that the undergraduates, in their most explorative and creative years, could help inject fresh ideas and innovation into the medium enterprises. Switzerland and Germany have strong vocational and technical education. Their technical universities have strong history of linkages with the industries, allowing the country to build up their industrial abilities such that their SMEs can build quality products desired worldwide. To make their degree more relevant to the targeted industries and the graduates more marketable, SIT could explore external validation where possible by industry associations. In Germany, vocational graduates are highly respected because the graduates often enter into guild-like professional associations that continue to guide post-graduation career development and also collective bargaining. While this is beyond the scope of SIT, the government could think of setting up the infrastructure to promote and support these developments. Support can include providing training, assistance and even grants to help medium sized companies dedicate resources for collaboration with technical universities and to spur these companies to develop rigorous internship and apprenticeship programmes. Next, some of our local universities may have larger than average proportions of international students such as Yale-NUS College. In an answer to my parliamentary question last year, MOE said that higher proportions of international students are required for specialty colleges to provide diversity for the type of courses that they run. SIT can focus on locals and to gear them for the skilled jobs needed to help build stronger local industries. Also, in the globalized and higher competitive job and economic environment of the 21st century, it will be important to impart the mindset for creativity and innovation to the SIT graduates. Finally, I will end with the continuation of the story of Lawrence, the banker whom I spoke about earlier. He did not have good academic results earlier in life and just barely made it through to the then-new 3rd university, SMU through an alternative admission pathway. He shared that he now feels he is as good as the graduates of the other established universities and had been able to prove that in his career. SIT will certainly face a lot of challenge competing with our other local universities in order to establish itself. I look forward to a ‘can-do’ spirit in its pioneers to define the Institute of Technology brand in their own way to make it one that will be as desired as the rest of our universities. The following was part of a speech I gave at the opening of a training centre today. The centre trains individuals in IT, Project Management and life skills as part of continuing education. Henry Ford once said, “Anyone who stops learning is old, whether at twenty or eighty. Anyone who keeps learning stays young.” Henry Ford is an American industrialist and the founder of Ford Motors Company. Ford did not invent the automobile nor did he invent the concept of assembly lines. But he combined these two brilliantly together to create the first automobile, the famous Model T car that middle class Americans could afford. Automobiles went from becoming expensive toys of the rich into practical machines of everyday lives that revolutionised transport and American industry. In the process, Henry Ford himself became very rich. Ford himself was a learner and doer. At 15, he learned how to dismantle and assemble back his pocket watch and became a famous watch repairman amongst his friends. As a young adult, he learnt about machines as an apprentice. He eventually worked for Thomas Edison, another great inventor and was promoted to chief engineer where he took charge of designing vehicles. After striking out on his own and after several unsuccessful attempts, he eventually pioneered an industrial model for car manufacturing that worked. Another great man, Albert Einstein had also said, “Once you stop learning you start dying”. Einstein is world renowned for his many scientific works, from the invisible world of quantum physics to the vast expanse of the universe, far beyond what the most powerful telescopes can see. What was interesting about Einstein was that he didn’t amount to much in the eyes of people around him when he was young. When Einstein’s father asked his son’s headmaster what profession the boy should adopt, he said, “It doesn’t matter; he’ll never make a success of anything.” He failed his first admissions examination to the Zurich Polytechnic. After graduating from the university, Einstein was denied a low-level teaching assistant position there. He eventually found work as a third-class government patent examiner. That was when he came out with some of his best discoveries, including the theory of Relativity. But he was one curious guy whose mind never stopped working and he never stopped learning and discovering new things to a ripe old age. I am a firm believer in life-long learning too, whether through formal courses or informal learning. More important though is how one should put what has been learnt into active practice. Many people know my wife and I as the founders of ASKnLearn, now called WizLearn. It went from a 4-man start-up in 2000 to become one of the top 2 e-learning providers to schools in Singapore, employing some 150 people before we sold off the business in 2007. What most do not know is that the idea for ASKnLearn was sparked off from a 2-day workshop I had attended at SIM in 1999. The workshop was on ‘Creating Values in Your Business’. At the workshop, we were challenged to think how we can make quantum leaps in our businesses by leveraging on new business models and technologies. It was the era of the dotcom boom in USA then. Famous examples such as Dell’s were cited. Michael Dell took advantage of the opportunities offered by the internet to bypass the middleman to sell high quality computers at affordable prices direct to customers. Business boomed for Dell through a new business model. The internet had opened up new possibilities to allow transformational changes to be made at breakneck speeds. Shortly after the training, at the grand old age of 34, I came down with chicken pox. I was the General Manager of an education group then. I was busy and had little time to reflect on things around me. I had to take 2 weeks of sick leave from work. To make matters worse, my son was just 1 month old then and I had to isolate myself from him too in case I spread the virus. In those free moments, I thought about what was said at the workshop. I thought to myself, “Hey, I am trained in computer science and I somehow ended up in different aspects of the education industry in various career moves. What can I do to use my training, the technology around us and my work experiences to create a new business that can deliver value in a novel way?” I decided to follow up on an old business idea I had thought of several years back but was not feasible due to the infancy of technology then. I called together some friends, who were not afraid to catch chicken pox from me. We did the traditional back-of-the-envelope thingy that many dotcom start-ups went through. I shared an idea for online learning and testing. My friends decided to invest, my wife and I left our jobs and ASKnLearn was born. So when you are prepared to learn and your mind is constantly active, you can make things happen. Much have been said about funding to schools since the Straits Times reported about funding cuts for top independent schools last week. It turned out that the report had inaccuracies that MOE corrected, with more reports subsequently published in the Straits Times, in TODAY , on ChannelNewsAsia and elsewhere. Nevertheless, MOE has a new funding formula of which details are not known to the public, but it will result in some funding cuts to 4 of the top schools. Criticisms of MOE’s move include that by Dr Koh Poh Koon, grassroots advisor and PAP’s chairman-designate for Punggol East, who said that ‘telling schools to cut down on air-conditioned classrooms is akin to “removing air-conditioning in A-class (hospital) wards to keep the C-class patients less envious”‘. I thought that was an inaccurate illustration to use because A-class patients pay a lot more than C-class patients. No one in Singapore really bothers about kids in international schools receiving top-end facilities because their parents paid for them. The funding adjustments are to public schools which are heavily paid for by taxpayers. Entry to public secondary schools and colleges is still mainly based on what the child has achieved academically and to some extent in co-curricula activities, regardless of social status. One cannot supposedly pay their way into a top public school. So the comparison cannot be about Class-A and Class-C wards. My concern in reading such statements is that they convey to readers that neighbourhood schools in Singapore with poorer resources are uncomfortable and miserable. They also create a sense of envy by those in neighbourhood schools of other educational institutions with better resources. Two years ago, JC student Kwek Jian Qiang created a storm when he wrote to the forum pages of TODAY implying that the best school facilities must be reserved for those with the best academic results, because they had worked hard to get there. He bemoaned the poor facilities in junior colleges compared to the Institute of Technical Education campuses. I had written to share my concerns about such ways of thinking. My concerns then still apply to this funding debate, that (1) academically good students will feel they deserve and will demand the best facilities; (2) students become jealous if the facilities in their schools are worse that in another school, creating an endless cycle of envy; (3) our youths become over-reliant on having good physical facilities that they lose the ability to improvise and overcome shortages in resources when we are faced with such situations. I like to support MOE’s broad direction to make resources more equitable across schools, except that there are not much details put out on what the new funding formula is and how it will improve resources in neighbourhood schools. More than just physical resources, what I feel is important is how learning programmes in neighbourhood schools can improve. Years of PRIME upgrading have already put our public schools’ infrastructure way above that of many other countries. Improvement can come in many other ways, such as smaller class sizes which Gifted Education children now enjoy. It can also be in the way teachers are deployed to schools. Independent schools have a lot of autonomy in the selection of teachers which other schools do not have. I like to see the discussion moving on to how we can resource neighbourhood schools to improve the learning experience rather than about physical infrastructure. 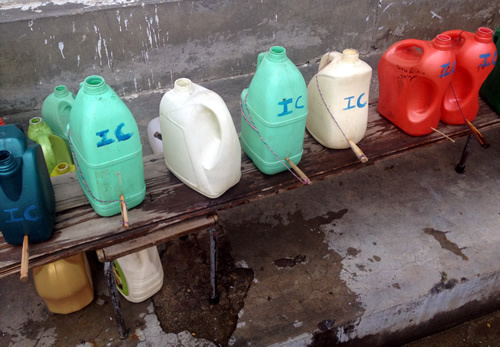 Innovation to overcome shortages through home-made taps out of plastic containers and wooden stoppers. This school in Bhutan encourages hand washing during recess but had a shortage of taps. They made these gadgets and parent volunteers filled it with water before recess so kids can line up to open the wooden stopper to wash hands. Involving the community for more resources. 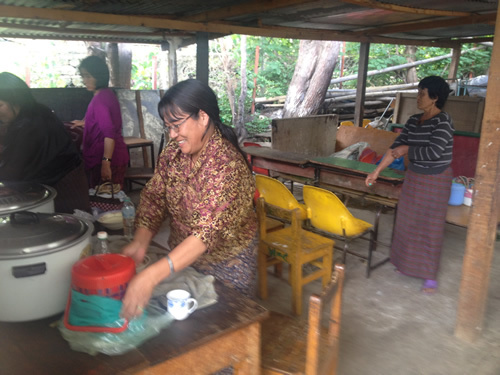 Parent volunteers contribute vegetables and rice and prepare food for needy students in this Bhutanese school every day. The school received top marks each year in its community involvement.